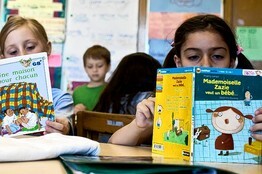 By September 2011, six elementary schools, one middle school and one charter school will have French programs. Public School 133 in Park Slope and P.S. 110 in Greenpoint are expected to unveil programs starting this fall. The growing number of French programs reflects the growing number of French. A survey conducted by the U.S. Census found 14,000 French lived in New York City in 2009, up from 12,000 in the 2000. Thanks for sharing. I would love my nieces and nephews to do a summer program, or after school program in French. (Or any foreign language). I tell you, learning french in you early thirties is hard!